The history and long age of British merchant sail ended with Waterwitch. Painting inspired in part by my home that overlooked Saint Austell Bay and the port of Par where Waterwitch called many a time. The original “Waterwitch of Gribben Head” has long since sold, edition is of only 100, we still have a few copies left. “Waterwitch“, a brigantine was the last engineless British square rigger to carry commercial cargo. As a result of interest shown and encouraged by a Meadus who lives in Canada, a descendant of the original owners, and ordered the first copy we decided to print “Waterwitch of Gribben Head” as an exclusive limited edition of only 100. Happily, many have sold to other families who are ‘Waterwitch‘ related. Completed in 1872 at Poole, Dorset and registered at Portsmouth she had a long career trading to most parts of the British Isles, northern Europe, the Azores and across the Atlantic. Her story, “Life at sea was easier than farming” much of it here, reads like the background to a good sea novel. Waterwitch finished her last voyage under the “Red Duster”, at Par, Cornwall on the 17th of May, 1936. 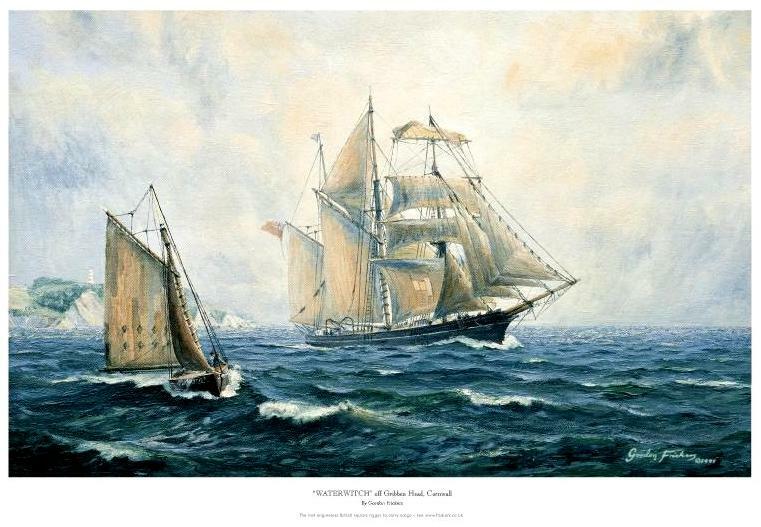 This gem of a painting shows “Waterwitch” bearing away to the West and making more sail, outward bound from the Port of Par, off the Gribben Head in Saint Austell Bay early one spring morning in a freshening South Easterly breeze. 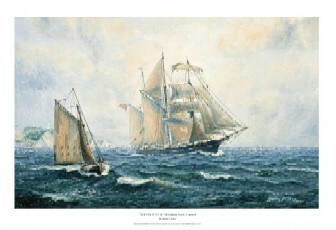 She is shown in her old age when owned by Stephens of Fowey, Cornwall and maintained at Par Docks. You could acquire or commission a painting like this from as little as £850.00. How much in my currency? Try our free XE Currency converter, it’s fun to use. Further Reading Useful facts + excellent stories about [CF7_get_post_var key='title'].